The word means imperfection. There is a new naturalism that reflect the scientific advances and a taste for dramatic action and emotion that is reflected in the contrast of light and colour, the use of rich textures, the creation of asymmetrical spaces and diagonal plans. There is a geographical variety in the style and the art is at the service of power, being it that of the church or that of the monarchy. 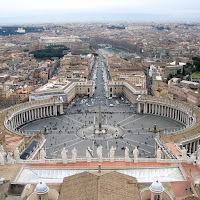 Due to this, there are two main centres: Rome with the Pope’s authority, and France, model of absolutist monarchy. In addition to this, the influence of Counter-Reform was evident. All these elements influence in the worry about plastic values. Architecture is marked by the rich use of plan forms, in which circular and central dominate over the long narrow naves of the former styles. Ornamentation is essential and the dramatic use of light gains a plastic value. Ceilings appear decorated with large-scale frescoes depicting impossible perspective while façades are dominated by central projections and illusory effects. The forms are an evolution from the Renaissance’s ones but now movement dominates structure with flowing, curving shapes. Even landscape is incorporated and elements such as gardens, squares, courtyards and fountains become an architectonical element. In this period, the rebuilding of Saint Peter’s cathedral influenced largely the architecture. Italy marked the most advanced style, while other countries such as France are going to be more classical. 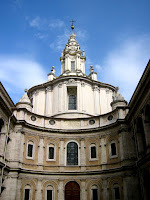 Architects working in Italy were Maderno, who finished the Vaticano’s façade, Longhena, author of Sainte Marie of the Salute in Venice, but, above all, there are two important masters: Bernini and Borromini. Bernini, being an architect, sculptor and painter, created a fusion of these arts in his works. He resourced frequently to the use of false perspectives and trompe-l’oeil to impact in the spectator. With him façades became a model with massive pilasters above a rusticated base. Some of his works are the design of Saint Peter’s Square, the Baldaquin, Santa Andrea. Borromini´s works spring from the contrast between convention and freedom. He used tradition as a basis but not as a law. His works are full of complicated structures, walls full of curves, wavy façades, dramatically broken pediments and impossible domes. Some of his works are San Carlo alle Quattro Fontane, San Carlos Borromeo, Oratorio degli Fillipenses. In France the Baroque style was elegant, ordered, rational and restricted. The models are rectilinear, closer to classicism. It aimed at showing the power of Louis XIVth monarchy. The most representative buildings are the Louvre, built by Le Vau and Perrault, and Versailles, where Le Brun and Le Vau built the palace that is accompanied by the gardens designed by Le Notre. In Central Europe Baroque developed late due to the Thirty Years War. In Austria it are important the figures of Fischer von Erlach and Hildebrant. In Germany there is an important influence of the Jesuits in the South, while in the North, protestant, the style is not so important. Palace architecture was important in the whole area. In England the main architect was Wren and the Baroque style was used to design town planning. The Russian version of the style is very decorative, in quite traditional churches, sometimes made of brick; later on the pla in Baroque was imported from the Low Countries to end by becoming an extravagant art. In Spain there were important changes during the Baroque period. The style evolved from the influences of the Escorial to decorated styles. This decoration is centred on the façade, while the rest of the building is made in a more sober way. During the Rococo a new style developed. 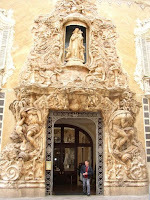 Name Churrigueresco, after the name of the architects family who created the style, it is characterised by the exaggerated decoration around the door. Spanish Baroque influenced in America where Plateresque style (the last Spanish Renaissance) was largely imitated and afterwards Churrigueresco developed, mainly in Mexico.